Spool knitting has been around for generations and is seeing a resurgence in popularity. Luckily for us crafters there are tons of companies making tools to make knitted web faster and easier than ever. 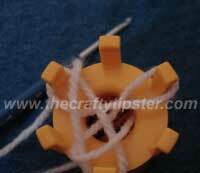 This tutorial uses a commercial spool knitting loom that I picked up at a thrift store. I haven’t seen it sold anywhere so it may have been part of a kit but there’s plenty of spool knitting looms available in most arts and crafts stores. Children of days-gone-by used to make their own knitters out of an empty thread spool and pins. There are also tons of great online tutorials on how to make your own. 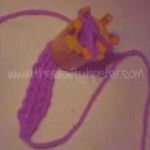 To make it easier to see the stitches, I’m going to show you how to do the basic stitch using just 3 of the pegs on my spool knitter – the basic technique is the same whether you use 2 pegs or dozens of pegs. 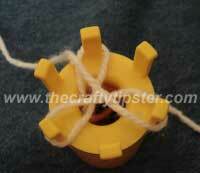 Lay the yarn across the spool to the next peg. 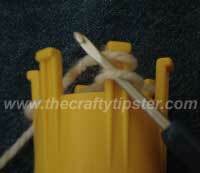 Drape the yarn around the back of the peg and back across the spool as shown in the picture. 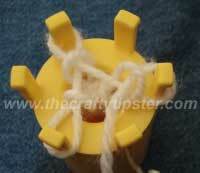 Bring the yarn around the outside of the third peg.Lay the yarn across the spool to the first peg as shown in the picture. It should look like figure eights between each of the pegs. Wrap the yarn around the outside of the 1st peg and drape it across the peg towards the 2nd peg.Make sure your new loop sits on the peg above the existing loop. This step can be done with your fingers, but it is much easier and quicker to use a tool of some sort. There are some spool knitting kits that come with a thread puller but I’ve found crochet hooks are perfect for the job. 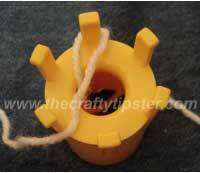 Put your puller/crochet hook into the bottom loop. 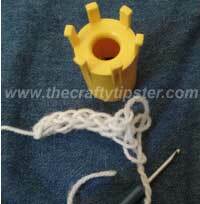 Take the bottom loop and pull it over the new loop and the top of the peg.Remove your puller from the loop and turn your spool to the next peg traveling in the same direction you did when you put the yarn on the spool in the earlier steps. 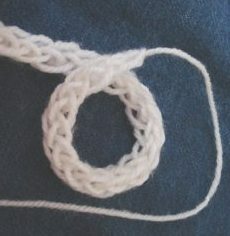 Using the same figure-8 pattern as in steps 1-3, wrap the yarn around the outside of the next peg. Repeat steps 5 and 6; continue creating stitches in this manner, going around the pegs. The stitches will look loose as shown in the picture in step 7; tighten them by periodically pulling on the tail/end of the yarn that you dropped down through the middle of the spool in step 1. 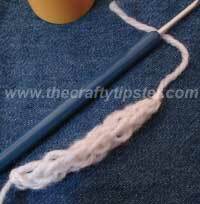 Continue knitting until your cording reaches the desired length. Spool Knitting Finishing Off – Step 1. Cut the yarn leaving a tail. Slide the tail under the loop on the first peg as shown to the left. 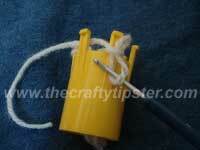 Pull the tail completely through the loop.Remove the loop from the peg. Spool Knitting Finishing Off – Step 2. 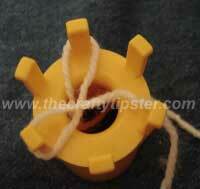 Repeat around the spool until all loops have been removed from the pegs.Pull the tail to tighten the ‘knot’. Spool Knitting – Completed Cord. Amazon has a number of options for spool knitting looms and knitting nancy’s. 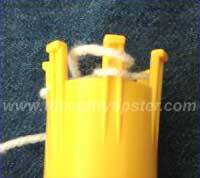 Among all of the store-bought spool knitting looms folks seem to have trouble with the included directions. 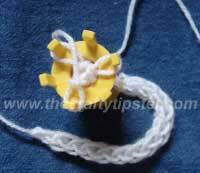 Now that you’ve visited The Crafty Tipster and learned how easy it is to spool knot, you shouldn’t have any trouble with these or any other knitters you might purchase. Susan Bates offers several different sizes of these French knitters. Part of what I really like about them is that you can see the cord as it is being knitted. I have the smallest size which makes a small, tight cord. 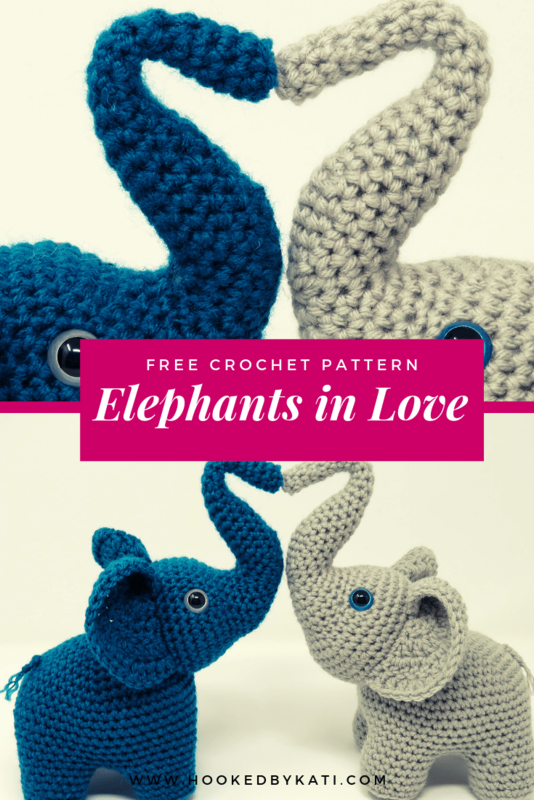 It works great with crochet thread and other more dainty yarns. This medium-sized one should work for most other projects using regular 4-ply yarns. It is being marketed as a knitter for working with beads but what I think makes this one such a great option is it comes with 3 different knitting heads – 4 prongs, 5 prongs and 6 prongs. Each of the heads sorta screws and snaps into place. This one also has a clear tube to better see your work and you can even separate the knitting head and the tube to make adjustments or check your stitches. This knitter also comes with a tool for lifting the loops. Want to make more than simple cords? This set of knitting looms is a great place to start. Make hats, scarves and all sorts of great things in a variety of different sizes with this set of looms. Each of the posts have a cap that helps keep the yarn from slipping off of the loom yet the yarn is still easily flipped over the peg as you make each stitch. It’s hard to see in the picture, but each of the pegs has a small channel that makes it so much easier to grab the thread you are looping over the pegs. The Darice looms also have a small peg on the outside of the ring for holding your starting thread – much easier that way than trying to wrestle with the starting thread while you are making the base loops and first row, trust me. These looms come in a great plastic carrying case with a plastic yarn needle and a loom pick too. 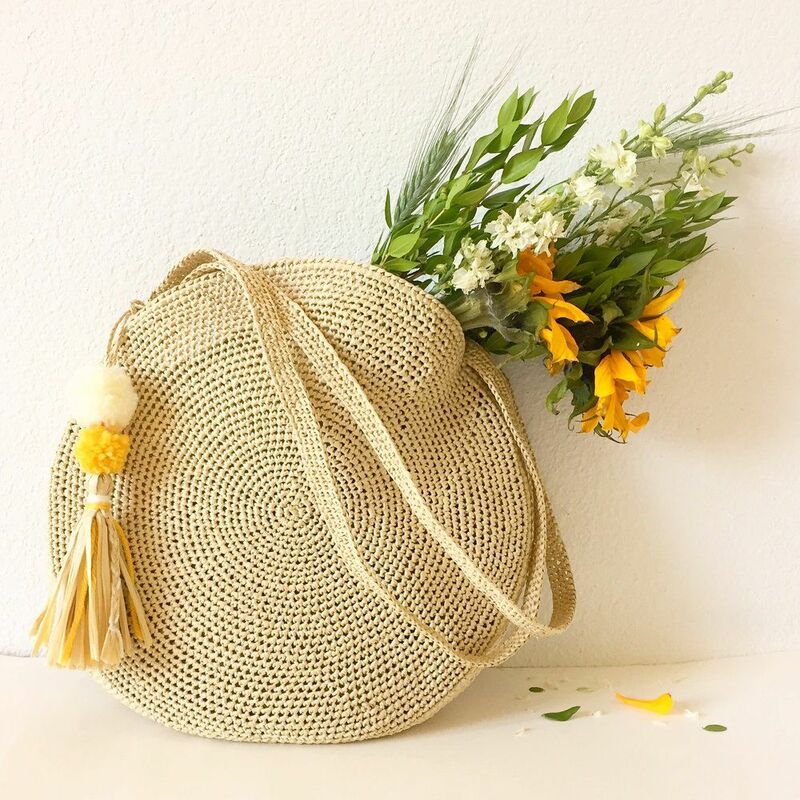 If you are looking for free spool knitting projects be sure to check out our projects which include a quick and easy soap cover, doll hat and skirt, cat toy and circular mat. I am a man who works with senior citizens for the city. 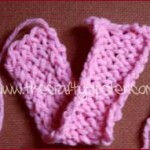 We have a group (11 women and 1 man) who meet twice a week at our center to crochet and knit on projects for charity. 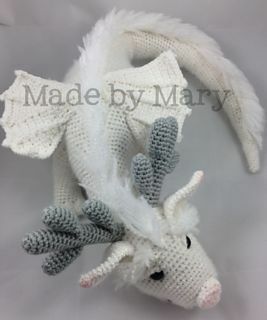 Some years ago I volunteered to help my wife knit Christmas gifts…..but, that’s another story. 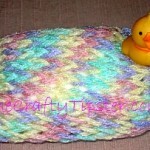 Let it suffice to say that I am looked to to help beginners get started with some yarn projects. 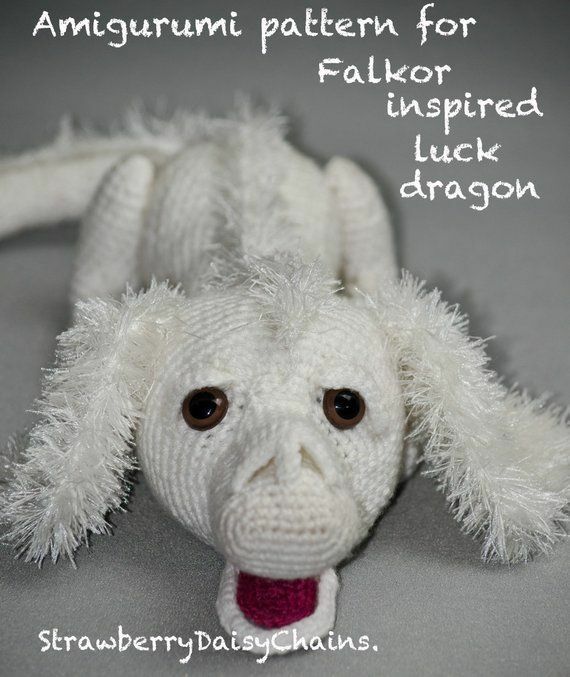 A few years ago friend of ours gave me a box of odds and ends….yarn, needles patterns, etc. Among the assorted collection was a spool knitter in the form of an apple. (Inscribed 1968) I remembered my sister having one on the shape of a glass but I hadn’t seen one for years and kept it. I showed it to the ladies who remembered using one in elementary school, but no one could remember how! .-= rick´s last blog ..Mapquest =-. We used to do this in Girl Scouts when I was young!! We used wooden spools with nails tacked into the top!! I couldn’t remember the pattern, though! Thank you for posting these instructions. You are most welcome Tricia. We never did this when I was in Girl Scouts but it would definitely make a great group craft. Thanks for the help! I am making knitted hats for preemies, and thought a small “tail” at the top would be a nice finish. I make the spool knit ‘tail’, then finish the hat to 8 stitches and combine it with the little tail, (one tail stitch to two on the hat) and pull the hat yarn through all 12 to close the top. My son made the spool for me, but while I remembered how to “knit’, my mother had always started it for me, and you saved my ‘good idea’ from being abandoned. Oh I’m so glad my spool knitting tutorial helped you out. Sounds like your use of the cording would be quite cute. I remember as a kid my Grand mother taught me how to do it. She would take the tails (we used to call them cat’s tails) and make all kinds of things with them. I had fun making them. Can not remember how we did the different colored ones. Gonna have to find a spool and make me one. We used to use finishing nails as the posts. Great tutorial. Thank you. Off to Michael’s to get some yarn and looms!